Press Release | Happy Independence Day, Orangutans! After releasing 20 Central Kalimantan orangutans on Valentine’s Day last February, the Borneo Orangutan Survival (BOS) Foundation releases 18 more orangutans from Nyaru Menteng as a dedication to the conservation effort and the pride in Indonesian wildlife in conjuction with the Indonesian 68th Independence Day 2013. Nyaru Menteng, Central Kalimantan, 16 August, 2013. On August 16 and 17, 2013, 18 rehabilitated orangutans depart from Central Kalimantan Orangutan Reintroduction Program at Nyaru Menteng and travel to pre-designated release points in the Bukit Batikap Conservation Forest. They consist of 12 female and 6 male orangutans whose details are provided in the attached Orangutan Release Candidate Profiles. These orangutans are flown from Tjilik Riwut Airport in Palangka Raya, to Dirung Airport in Puruk Cahu, Central Kalimantan. From Puruk Cahu, they are directly flown by helicopter to Bukit Batikap Conservation Forest. 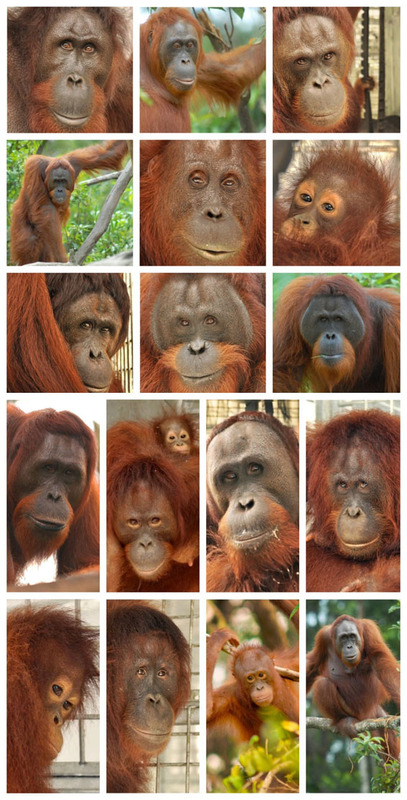 Due to the large number of orangutan release candidates, they are divided into two groups. Nine orangutans are flown on the first day and 9 orangutans are flown on the second day. In addition to commemorating the 68th Indonesian Independence Day, this event is still part of an effort to meet the target stated on the Indonesian Orangutan Action Plan and Conservation Strategy 2007- 2017, launched by the president of the Republic of Indonesia during the Climate Change Conference in Bali, 2007. The Action Plan states that all eligible orangutans in rehabilitation centers should be released by 2015. Throughout 2012, the BOS Foundation has released 44 orangutans in Central Kalimantan, and plans to release 80-100 orangutans in Bukit Batikap by the end of 2013 to meet this target. So far in 2013, the BOS Foundation has released 20 orangutans on Valentine’s Day last February. The success of orangutan conservation heavily relies on support from various parties, including the government, communities, and the private sector. Therefore the BOS Foundation works closely with the government of Indonesia at all levels in the conservation of orangutans and their habitat. At the provincial level, the BOS Foundation collaborates with the Provincial Government of Central Kalimantan as outlined on the Cooperation Agreement, effective since December 31, 2009, on orangutan and habitat conservation in Central Kalimantan. This release event is also supported by the Ministry of Forestry, Central Kalimantan Provincial Government, Murung Raya Regency Government, and the people of Murung Raya. The BOS Foundation would also like to convey their gratitude for the moral, financial and logistical supports from private sectors such as BHP Billiton and PT. Indo Muro Kencana, as well as individual donors, partner organizations and other conservation organizations across the globe who are concerned with orangutan conservation in Indonesia. The Borneo Orangutan Survival (BOS) Foundation is an Indonesian non-­profit organization dedicated to the conservation of the Bornean orangutan and its habitat, in cooperation with local communities, the Indonesian Ministry of Forestry and international partner organizations. Founded in 1991, BOS Foundation is currently taking care of more than 800 orangutans with the support of 420 highly devoted staff, as well as experts in primatology, biodiversity, ecology, forest rehabilitation, agroforestry, community empowerment, education, and orangutan healthcare. For more information, please visit http://www.orangutan.or.id.